Have you experienced being watched? I assume that you didn't like it. Sometimes all we can do is ignore them and continue with our everyday life. But what if the stalking doesn't stop there? What if you feel that your privacy is intentionally violated? What will you do? Confront them? Yes, that is easy if you are being stalked by regular voyeurs. But what will you do if you are being stalked by something that is beyond of this world or something beyond reality? Tala Comics Studio presents an independent film that tells a story of a struggling writer's life on his condo unit. At first, everything seems to be normal not until he discovered that he is being stalked by an unknown person. He then seek help from friends and Colleagues on how will he catch the voyeurs and catch them red handed. But on the process of knowing who the perpetrators are comes a twisted revelation that he didn't expect. 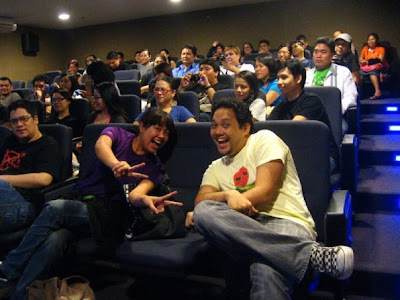 July 7, 2009, I was invited by Cynthia Arre to watch his husband, Arnold Arre's first Indipendent Movie. Being a fan of Arnold on his graphic novels and comic books, I became curious if Arnold's skills in comics will also be as good as it is in film. So I went to FullyBooked Bonifacio High Street and sat with everybody including some comic book writers and artist themselves like Marco Dimaano and Jamie Bautista and the director extraordinaire Quark Henares and be witness to Arnold's first film baby. The story is simple and precise but creepy enough to scare the hell out of me. Though the use of video as a device in a suspense thriller is not quite original for it is already used in several local and foreign films. The story can be predictable at times but still has that scare factor on several scenes. Sam Alapan being the main actor of the film performs well. Not sure if this is his first gig but I can see that he can act. Though I find most of the scenes very artificial, his reactions in the screen is surprisingly exceptional. Showing that you are scared on the screen without overreacting is hard specially for a first timer. 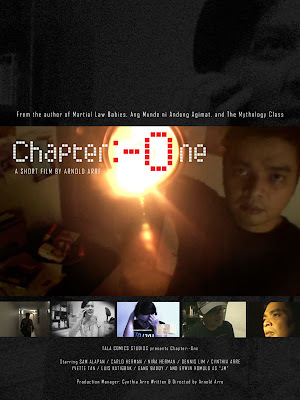 Summing everything, Chapter One can be your average horror flick that swerves in the line of psycological thriller. Aside from getting scared, you will end up thinking while watching the film. Arnold Arre being a good story teller on his whole comic career had succeed to bring his craft in to another level which is film that is surely not his last for we know that Arnold Arre has more to show. So if you have the chance to watch this film, grab it. 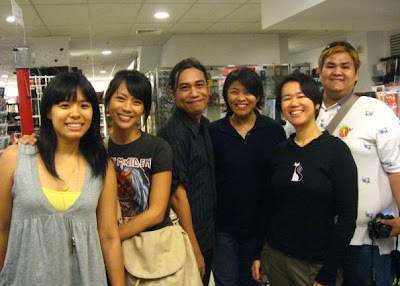 Some photos in the premiere night at FullyBooked Bonifacio High Street.